Hookworms, although uncommon, are an important cause of gastrointestinal bleeding in patients of all ages, researchers remind readers in the November issue of Clinical Gastroenterology and Hepatology. Puneet Chhabra and Deepak K. Bhasin describe the case of a 72-year-old man with Parkinson disease who presented with fatigue, dyspnea on exertion, and intermittent melena for 3 months. He had been found to have iron-deficiency anemia that required transfusion. Esophagogastroduodenoscopy revealed multiple live worms attached to the duodenal mucosa sucking blood (see figure). The worms had blood inside their body, and removal of the worms revealed underlying bleeding erosions. Using light microscopy, the researchers identified the worms as Ancylostoma duodenale (hookworms). The patient was treated with oral mebendazole (100 mg twice each day for 3 days). His melena resolved and his hemoglobin increased to 10.2 g/dL within a week. Chhabra and Bhasin state that hookworms cause occult and overt bleeding. They are frequently discovered when healthcare workers search for a cause of iron deficiency anemia. 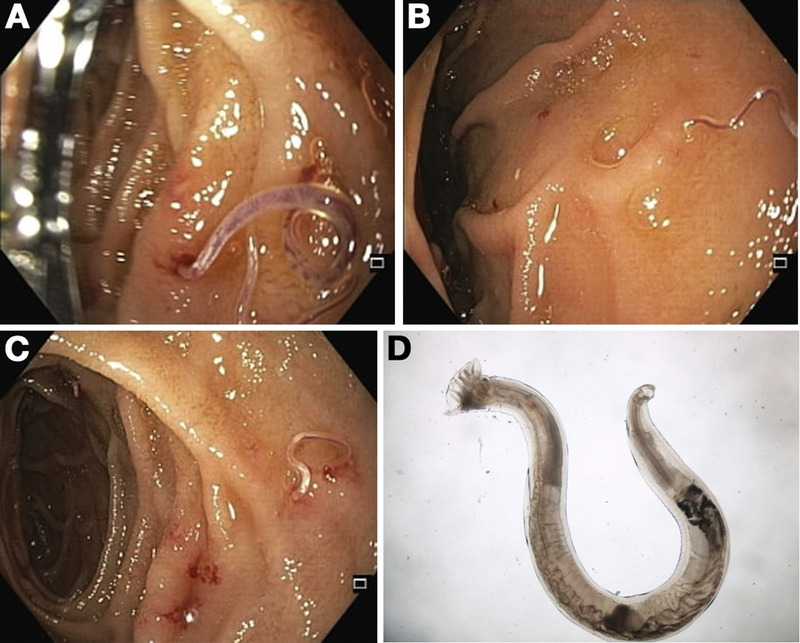 These worms can be identified in stool or by endoscopy, enteroscopy, or capsule endoscopy. Patients are usually treated with antihelminthic agents (albendazole or mebendazole) for 1–3 days. Does Enhanced Sterilization of Duodenoscopes Reduce Contamination?